IMPORTANT NOTICE: This is a custom trek. Contact Tricia Donaldson for more information. This expedition will take us from the capital city of Kathmandu, to the ancient city of Bhaktapur, to the beautiful countryside of Mankhu village. And on the return a short stop in Thailand will take us to the beaches of Railay and Hong or Poda Island, and the town of Krabi. In Nepal we will be working with the Mountain Fund at Her Farm, a 100% owned and operated farm where 30 women and children who come from abusive and difficult circumstances have access to healthcare, education and economic opportunity in an environment where human rights are valued and respected. 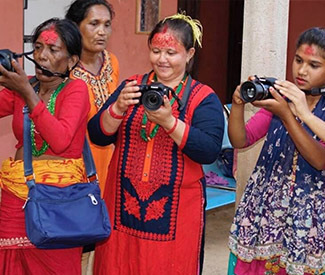 In addition, Her Farm is training women in film, photography, editing and radio broadcasting, all non-traditional female jobs in Nepal that will help bring much needed income. They are helping create women leaders in the community, leaders who, in turn are supporting other women in the community and empowering them to reach their full potential. We will spend six days at Her Farm teaching workshops in photography, filmmaking, editing, etc, helping with english classes, volunteering at the elementary school, working in the fields, helping with some improvement projects at the farm, and just experiencing life in rural Nepal. 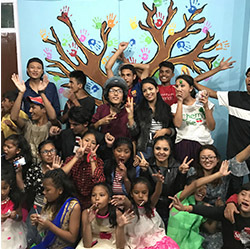 In addition to our time at Her Farm we will visit Buddhist temples in Kathmandu, explore the streets of Bhaktapur, where you feel like you have gone back in time, and spend a day volunteering at the Orphan Children Rescue Center, a home for orphaned and at-risk children. After we depart Nepal we will spend a few days in Thailand where we will travel by long tail boat to the beach areas of Railay and one of the near by islands to explore and swim, and in Krabi, we will visit an elephant refuge and climb the 1237 steps to the top of TIger Cave Temple at sunset. 3. Experience •	Arrive in-country. •	Enjoy a trip of a lifetime! We are committed to supporting you every step of the way, both before and during your Expedition. Click here to read about TFK’s Registration and Cancellation Policies. After signing up for an Expedition, Trekkers receive a Fundraising Kit, and access to the Trekker Resource Center, with online tips and tools to help you succeed. Contact our Director of Operations, Tricia Donaldson, for more information. Select a Trekker‘s name below to visit their personal fundraising page. Help them reach their goal by making a donation today.